Association President/CEO Roger Isom and Director of Regulatory Affairs Jodi Raley attended a meeting with the California Air Resources Board today on the proposed next versions of the Large Spark Ignited (LSI) Regulation, which regulates forklifts and floor sweepers/scrubbers, and the Transportation Refrigeration Unit (TRU) Regulation. The first steps in this process is to “survey” the industry, and the Association reviewed and commented on the proposed survey and how it would be carried out for cotton gins. Following this meeting, the Association will be conducting a survey for the industry that will be used to help formulate the rule. 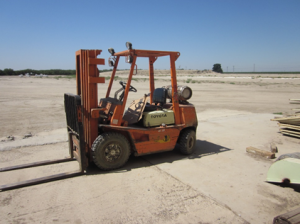 This was conducted in the original forklift rulemaking and one of the reasons the ag provisions of the forklift rule where much more lenient than the general business requirements. It is this level of involvement in the process that will hopefully provide the best outcome possible given the state’s air quality issues. This entry was posted in NEWS & ISSUES on April 27, 2016 by ccgga.